Blood is a liquid tissue. Suspended in the watery plasma are seven types of cells and cell fragments. the white cells settle on top of them forming the "buffy coat". The fraction occupied by the red cells is called the hematocrit. Normally it is approximately 45%. Values much lower than this are a sign of anemia. defense of the body against infections and other foreign materials. All the WBCs participate in these defenses. are produced in the bone marrow (more than 1011 of them each day in an adult human!). arise from a single type of cell called a hematopoietic stem cell — an "adult" multipotent stem cell. more stem cells (A mouse that has had all its blood stem cells killed by a lethal dose of radiation can be saved by the injection of a single living stem cell!). 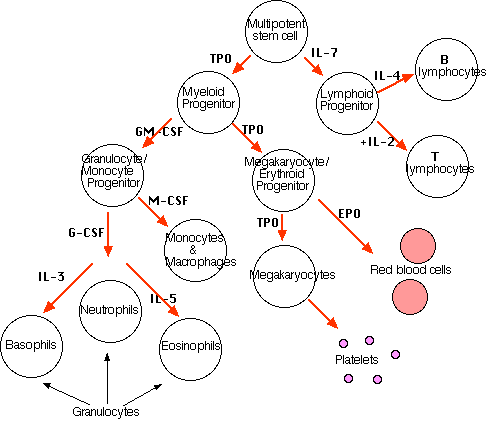 cells that begin to differentiate along the paths leading to the various kinds of blood cells. the need for more of that type of blood cell which is, in turn, controlled by appropriate cytokines and/or hormones. For example, Interleukin-7 (IL-7) is the major cytokine in stimulating bone marrow stem cells to start down the "lymphoid" path leading to the various lymphocytes (mostly B cells and T cells). Erythropoietin (EPO), produced by the kidneys, enhances the production of red blood cells (RBCs). Thrombopoietin (TPO), assisted by Interleukin-11 (IL-11), stimulates the production of megakaryocytes. Their fragmentation produces platelets. Granulocyte-macrophage colony-stimulating factor (GM-CSF), as its name suggests, sends cells down the path leading to both those cell types. In due course, one path or the other is taken. Under the influence of granulocyte colony-stimulating factor (G-CSF), they differentiate into neutrophils. 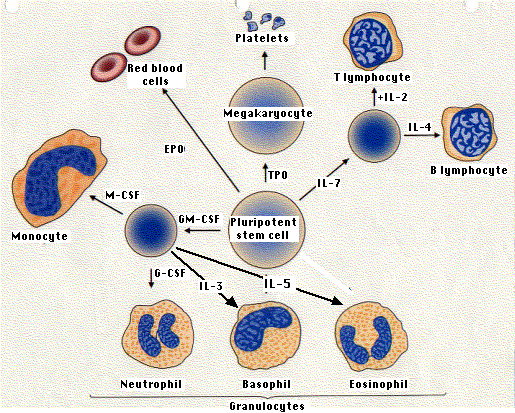 Further stimulated by interleukin-5 (IL-5) they develop into eosinophils. Interleukin-3 (IL-3) participates in the differentiation of most of the white blood cells but plays a particularly prominent role in the formation of basophils (responsible for some allergies). Stimulated by macrophage colony-stimulating factor (M-CSF) the granulocyte/macrophage progenitor cells differentiate into monocytes, macrophages, and dendritic cells (DCs). Link to a discussion of how transplants of hematopoietic stem cells are used in therapy. The most numerous type in the blood. Average 7 µm in diameter. Women average about 4.8 million of these cells per cubic millimeter (mm3; which is the same as a microliter [µl]) of blood. Men average about 5.4 x 106 per µl. RBC precursors mature in the bone marrow closely attached to a macrophage. They manufacture hemoglobin until it accounts for some 90% of the dry weight of the cell. In mammals, the nucleus is squeezed out of the cell and is ingested by the macrophage. All the mitochondria as well as the endoplasmic reticulum and Golgi apparatus are destroyed. No-longer-needed proteins are expelled from the cell in vesicles called exosomes. This scanning electron micrograph (courtesy of Dr. Marion J. Barnhart) shows the characteristic biconcave shape of red blood cells. Thus RBCs are terminally differentiated; that is, they can never divide. They live about 120 days and then are ingested by phagocytic cells in the liver and spleen. Most of the iron in their hemoglobin is reclaimed for reuse. The remainder of the heme portion of the molecule is degraded into bile pigments and excreted by the liver. Some 3 million RBCs die and are scavenged by the liver each second. Red blood cells are responsible for the transport of oxygen and carbon dioxide. To each of these is attached the prosthetic group heme. One molecule of oxygen can bind to each heme. Under the conditions of lower temperature, higher pH, and increased oxygen pressure in the capillaries of the lungs, the reaction proceeds to the right. The purple-red deoxygenated hemoglobin of the venous blood becomes the bright-red oxyhemoglobin of the arterial blood. Under the conditions of higher temperature, lower pH, and lower oxygen pressure in the tissues, the reverse reaction is promoted and oxyhemoglobin gives up its oxygen. The pressure of oxygen in the lungs is 90–95 torr; in the interior tissues it is about 40 torr. Therefore, only a portion of the oxygen carried by the red blood cells is normally unloaded in the tissues. However, vigorous activity can lower the oxygen pressure in skeletal muscles below 40 torr, which causes a large increase in the amount of oxygen released. This effect is enhanced by the high concentration of carbon dioxide in the muscles and the resulting lower pH (7.2). The lower carbon dioxide concentration (and hence higher pH) at the lungs promotes the binding of oxygen to hemoglobin and hence the uptake of oxygen. Temperature changes also influence the binding of oxygen to hemoglobin. In the relative warmth of the interior organs, the curve is shifted to the right (like the curve for pH 7.2), helping to unload oxygen. In the relative coolness of the lungs, the curve is shifted to the left, aiding the uptake of oxygen. Although the oxygen transported by RBCs make possible cellular respiration throughout the body, RBCs lack mitochondria and so cannot perform cellular respiration themselves and must subsist on glycolysis. It enters (and leaves) the cell by diffusion through the plasma membrane. Once inside, about one-half of the CO2 is directly bound to hemoglobin (at a site different from the one that binds oxygen). 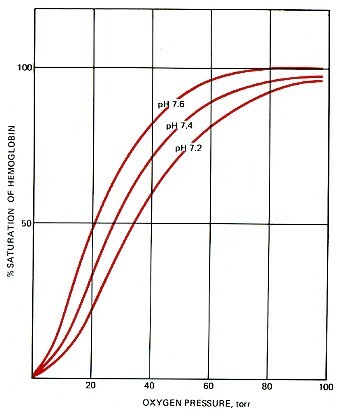 hydrogen ions (H+) that bind to the protein portion of the hemoglobin (thus having no effect on pH). The bicarbonate ions pass out of the red cell by facilitated diffusion through transmembrane channels in the plasma membrane. When the red cells reach the lungs, these reactions are reversed and CO2 is released to the air of the alveoli. the amount of hemoglobin in them. Anemia has many causes. One of the most common is an inadequate intake of iron in the diet. Red blood cells have surface antigens that differ between people and that create the so-called blood groups such as the ABO system and the Rh system. Link to a discussion of blood groups. consist of lymphocytes and monocytes with relatively clear cytoplasm, and three types of granulocytes, whose cytoplasm is filled with granules. B lymphocytes ("B cells"). These are responsible for making antibodies. mature into fully functional cells. Monocytes leave the blood and become macrophages and one type of dendritic cell. This scanning electron micrograph (courtesy of Drs. Jan M. Orenstein and Emma Shelton) shows a single macrophage surrounded by several lymphocytes. cellular and extracellular debris (e.g., the extruded nuclei of developing red blood cells — link). The most abundant of the WBCs. This photomicrograph shows a single neutrophil surrounded by red blood cells. Neutrophils squeeze through the capillary walls and into infected tissue where they kill the invaders (e.g., bacteria) and then engulf the remnants by phagocytosis. This is a never-ending task, even in healthy people: Our throat, nasal passages, and colon harbor vast numbers of bacteria. Most of these are commensals, and do us no harm. But that is because neutrophils keep them in check. can reduce the numbers of neutrophils so that formerly harmless bacteria begin to proliferate. The resulting opportunistic infection can be life-threatening. The number of eosinophils in the blood is normally quite low (0–450/µl). However, their numbers increase sharply in certain diseases, especially infections by parasitic worms. Eosinophils are cytotoxic, releasing the contents of their granules on the invader. an anaphylactic response to insect stings. Platelets are cell fragments produced from megakaryocytes. These polyploid (128n) cells in the bone marrow send pseudopodia-like projections into the lumen of adjacent blood vessels. Blood flowing through the vessel shears off the platelets. Blood normally contains 150,000–400,000 per microliter (µl) or cubic millimeter (mm3). This number is normally maintained by a homeostatic (negative-feedback) mechanism [Link]. If this value should drop much below 20,000/µl, there is a danger of uncontrolled bleeding. When blood vessels are cut or damaged, the loss of blood from the system must be stopped before shock and possible death occur. This is accomplished by solidification of the blood, a process called coagulation or clotting. network of insoluble fibrin molecules. Details of the clotting process are in a separate page. Link to it. to places ("sinks") where they will be removed from the blood. exchange organs like the kidney, and skin. Proteins make up 6–8% of the blood. They are about equally divided between serum albumin and a great variety of serum globulins. Serum is blood plasma without fibrinogen and other clotting factors. The serum proteins can be separated by electrophoresis. A drop of serum is applied in a band to a thin sheet of supporting material, like paper, that has been soaked in a slightly-alkaline salt solution. At pH 8.6, which is commonly used, all the proteins are negatively charged, but some more strongly than others. Link to an explanation of how pH affects the net charge on proteins. A direct current can flow through the paper because of the conductivity of the buffer with which it is moistened. As the current flows, the serum proteins move toward the positive electrode. The stronger the negative charge on a protein, the faster it migrates. After a time (typically 20 min), the current is turned off and the proteins stained to make them visible (most are otherwise colorless). The separated proteins appear as distinct bands. 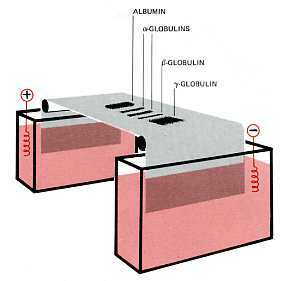 The most prominent of these and the one that moves closest to the positive electrode is serum albumin. The other proteins are the various serum globulins. Most antibodies are gamma globulins. Therefore gamma globulins become more abundant following infections or immunizations. serum with an IgA myeloma protein. Discussion of the 5 classes of antibody molecules. high HDL values are good. More on cholesterol How cholesterol is taken into cells. In the United States, in 2001, some 15 million "units" (~475 ml) of blood were collected from blood donors. Some of these units ("whole blood") were transfused directly into patients (e.g., to replace blood lost by trauma or during surgery). RBCs. When refrigerated these can be used for up to 42 days. platelets. These must be stored at room temperature and thus can be saved for only 5 days. plasma. This can be frozen and stored for up to a year. A variety of infectious agents can be present in blood. each unit of blood is tested for a variety of infectious agents. by the so-called nucleic acid-amplification test (NAT). Thanks to all these precautions, the risk of acquiring an infection from any of these agents is vanishingly small. Despite this, some people — in anticipation of need — donate their own blood ("autologous blood donation") prior to surgery. Donated blood must also be tested for certain cell-surface antigens that might cause a dangerous transfusion reaction in an improperly-matched recipient. This is discussed in a separate page — link to it. Years of research have gone into trying to avoid the problems of blood perishability and safety by developing blood substitutes. Most of these have focused on materials that will transport adequate amounts of oxygen to the tissues. Some are totally synthetic substances. Others are derivatives of hemoglobin. Although some have reached clinical testing, none has as yet proved acceptable for routine use.